Sir Brian Hoskins was the Founding Director of the Grantham Institute for Climate Change and the Environment, and is now its Chair. He has been a Professor in Meteorology at the University of Reading for more than 35 years, and now fills the position on a part-time basis. For 10 years he also held a Royal Society Professorship. His research is in weather and climate, in particular the understanding of atmospheric motion on all scales. His international roles have included being vice-chair of the Joint Scientific Committee for the World Climate Research Programme, President of the International Association of Meteorology and Atmospheric Sciences and involvement in the 2007 IPCC international climate change assessment. He has also had numerous UK roles, including playing a major part in the 2000 Report by The Royal Commission on Environmental Pollution that first proposed a 60% target for UK carbon dioxide emission reduction by 2050. In 2018 he completed 10 years as a member of the UK Committee on Climate Change. 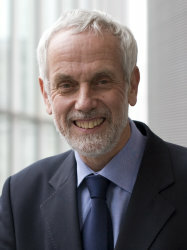 He is a member of the science academies of the UK, USA, China and Europe, and has received a number of awards, including the top prizes of the UK and US Meteorological Societies and the Buys Ballot Medal (awarded by the Netherlands every 10 years). He was knighted in 2007 for his services to the environment.